I'm thrilled to announce I've been selected as a brand ambassador for Dr. Weil Integrative Footwear's Walkabout: A 28-day Quest for Good Health. The Walkabout is a call to action, meant to get people to walk their way to optimum health. Walking is something everyone can do, at any age or fitness level. The "Good Health" goal of the campaign is not just about fitness or weight loss, but about getting bodies energized and moving to improve physical AND mental efficiency and well-being. 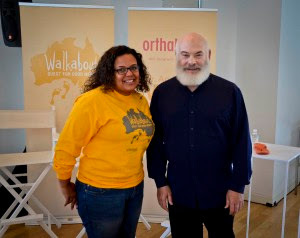 I wasn't able to attend the Walkabout kick-off virtual tea event in New York last week but I did receive a starter kit including a snazzy pair of Dr. Weil Integrative Footwear Rhythm Lace-up Walkers (available exclusively via QVC and FootSmart), Walkabout logo tee, boomerang, bag and cap, and a copy of Dr. Weil's book Spontaneous Happiness. I have very high arches and, apparently, a peculiar gait, so I was curious about the fit. The Rhythm Walkers are very, very comfortable. Especially in the ball of the foot, where I often experience pain. 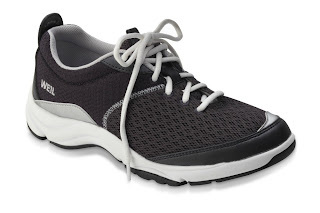 Bob was eyeing them, too, since he prefers shoes with a less-constrictive toebox and a sturdy tread. I might have to get him a pair to be my Walkabout buddy! Clearing my mind and getting more physical activity are both challenges I am ready to undertake. I'm excited to join this movement and to see how I've changed, physically and spiritually, in the next few weeks. I'm hoping that I will learn new things about myself and my capabilities. For more information, read the Healthy Footnotes blog and follow the #Walkabout hashtag. How do you keep yourself motivated to keep moving? In accordance to the FTC Guidelines and the WOMMA Code of Ethics, I am disclosing that, as a brand ambassador, I received the complimentary products mentioned above. No other compensation was provided and all opinions are, as usual, my own. Congrats! I'm a fan of Dr. Weil, and had no idea about the Walkabout (sorry to say that term always reminds me of that episode of LOST). I'm eager to follow your progress!